Well, it finally happened. We went out in public and completed our first Third Level test in front someone other than Ms. C and the local wildlife population. The best part is that we survived without any humiliation except for a runny nose from the cold air. Our debut came at one of our favorite schooling show venues at a Fix-a-Test clinic. For those who don’t talk “horse,” that means you ride your chosen dressage test, the judge discusses what she saw, you have a quick schooling session with the judge, and then you ride your test again trying to implement the judge’s feedback. Sounds easy enough, but as I write this, my muscles are aching from the effort and stamina it took to ride two Third Level tests in a 20-minute span. It is a good ache since I came home with great feedback on what we need to work on to up our scores and with the confidence that we are where we need to be in competition. As one of my wise friends told me, “Sure you can continue to get 70% doing 20-meter circles, but where is the fun and challenge in that. Go for it! Try the harder levels, take your hits, learn and move on.” Of course, I want 70% at every level…but that is just me being a little greedy. Our goals for today were 1) Finish the test. 2) Hit the 60th percentile. Well, we finished, but we just barely missed that second goal in our first attempt with a 59.871%. The high points of that first ride were surprisingly our flying changes (what?! No way! ), our transitions in and out of the extended trot, and our extended canter with the comeback to collected canter. The not so good – well, our turn on the haunches continue to vex us. We start off strong and then someone plants his hind legs and pivots. Ike also struggled with the correct bend in his half pass work, but we know who takes the blame for that and it isn’t his majesty. The judge noted that I looked like I was perched on Ike rather than really sitting deep in the saddle. Grr, it is one of my rider issues that continues to plague the journey. So we worked on that in the schooling session as well as improving the bend in our half pass work. Right now, I must be very clear with my aids and remind Ike almost every other stride. Lack of focus for me means a straighter horse under me. So trying to stay focused, we took a deep breath and headed up centerline for the second try. So there it is, we can now claim to be a Third Level team…that bronze tinted dream is starting to come into focus. Squeeee! No matter what you call them, equestrians are masters at telling themselves alternativefacts/lies/falsehoods. We can pretty much rationalize anything if it is related to our precious equines. “My dearest pony NEEDS this new brush.” No, your pony does not care that this brush is handmade in England by master brush makers. Your pony just wants for you to be done with your latest grooming session so he can roll in the new mud hole created after last night’s rainstorm. “This new saddle pad will make the saddle slip less and improve my score.” Umm, sure. Just like the 15 others that you have squirreled away in your spare bedroom closet. You like it because you don’t have that color in your stack. You like the braided trim that none of your other pads has. It is okay, admitting the problem is the first step to recovery. “Ooooh, this mane and tail product smells divine so that must mean it works better than the one (or ten others) that I already have in my tack box.” Every once in a while, I dive into the depths of my tack box to see what is lurking in the back besides some mouse poop. I have bottles of shampoo that I bought 10 years ago (bathing the boys is not a priority). I have conditioner that we got as a prize. I have about 40 sample sized bottles from competitor bags. There are $100’s of dollars worth of products…it won’t stop me from buying more. “Going to the clinic with X will surely mean that we will improve.” You see it all the time. A rider will go to any and every clinic with a big name rider. They love to tell you all the big names that they have ridden with over the years, yet they are still struggling with the basics. What they lack is a clear system to help them master the basics and see steady progress forward. Regular training with the one competent person is what they need. “I will only be at the barn for 30 minutes.” Bahahahahahahahaaa! Ask any significant other how long a typical visit to the barn takes. They will tell you the truth. They will get a good laugh about this lie. “I can get my horse tacked and ready for our class in 30 minutes.” Many years of showing has taught me that when I try to cut preparations that close, something can and will go wrong. 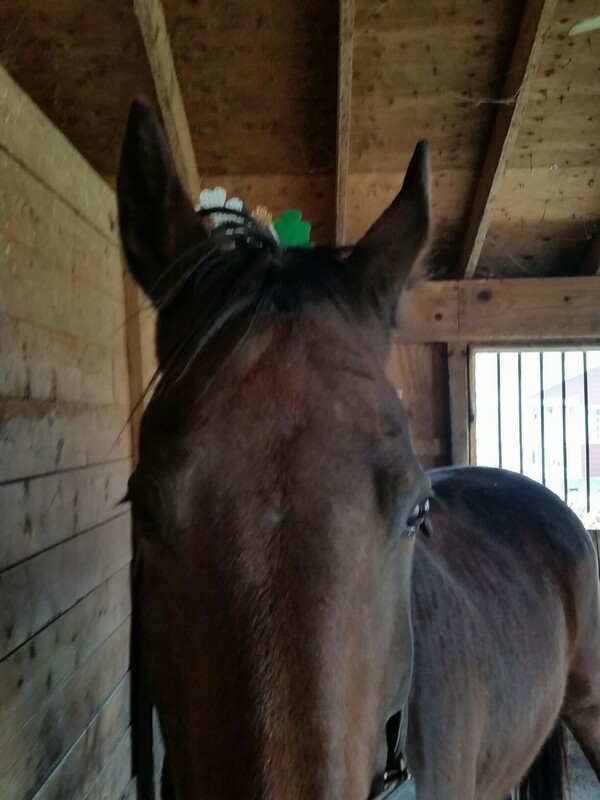 Your horse decides today is the day he won’t stand still for braiding. Your gloves decide they no longer want to be a pair. Your horse does his best giraffe impression so getting the bridle on is impossible. The zipper on your boot breaks. Mysterious stains appear on your jacket and breeches and they stubbornly resist your attempts to rub them off. “It won’t be that hot/cold this weekend at the show.” The sun is searing hot or the frigid winds make you debate the merits of fur-lined boots. You then begin to question the whole showing concept. A weekend sipping margaritas by the pool sounds divine. Why didn’t you just curl up under the covers with a good book instead of braving 20 degree wind chills? “If I am careful, I can clean the stall without getting anything on my white breeches.” Perhaps someone else has this expert skill level. I do not. “I am going to stop at the tack store and just pick up my horse’s supplement.” And then somehow a pair of socks, a belt, some treats, a new show shirt (it was on sale! ), and a deliciously scented tail detangler appear in your shopping basket. “I don’t need to wear a helmet.” YES YOU DO. End of discussion. “That is a great price for that pair of boots/saddle/bridle/bit.” It is amazing once you are indoctrinated into the equine world how $500 no longer seems like a lot of money. $800 boots? What a bargain! I’m pretty sure that there is a change in your brain chemistry when exposed to the scent of a horse that rewires normal monetary logic. Bonus “My horse is the best horse/most handsome/most talented.” This is one alternate fact that I think is okay. We all certainly cannot have the number 1 horse, but there is certainly nothing wrong with believing that you do. It shows true affection and love and there is nothing wrong with that.